https://youtu.be/sOUnDNa-vNo this is the best video I've seen, and it convinces me that music from note 1 is actually upbeat then downbeat. Red dot up to green dot, down to red beat. You start with foot in air. It goes down. That is start of music and note 1. For quarter notes, it goes up and then down. When it hits, that is start of note 2. So motion is actually upbeat, then downbeat. Peter, it seems to me that you are contradicting yourself. On the so called "upbeat", there is no music. You titled this thread: "Music is actually upbeat..." So, I see a contradiction. However, I agree with your last sentence: "So motion is actually upbeat, then downbeat." Yes, motion...but not necessarily music. When you start a song, foot is in the air, and it comes down, and when it hits, you start the music. And you continue note as your foot goes up, therefore it is an upbeat motion to the top position, then it goes down, therefore the downbeat. The first downbeat motion your foot does has no music. I don't know for sure, but when a conductor uses his baton, I think he goes from top position and you start the music. Cutting to the point, attached is a picture from a book 1. 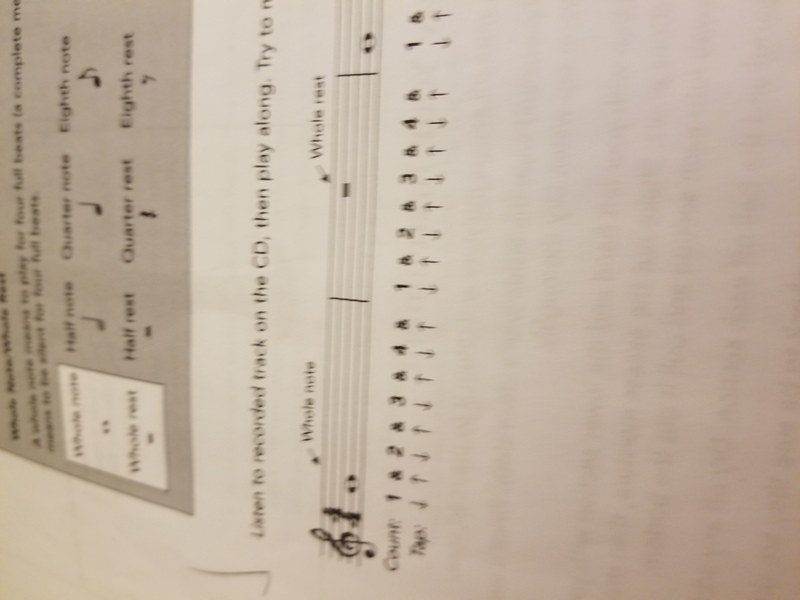 It shows you starting the whole note with foot coming down which seems incorrect. That would mean "1" is in the air, "and" at the bottom, and "2" would be at the top. It's really reversed. Ok here's photo referenced above. I couldn't add photo in edit mode on mobile. > downbeat motion your foot does has no music. For anything, including your foot, to go down, it has to go up first. In order to go down again, it must again go up. Foot tapping is an image, a way (not the only way) to teach metric pulse and the rhythmic relationships that come with it. > think he goes from top position and you start the music. Yes, the conductor gives a preparatory ("prep") beat in tempo so the players will know both when to start the first note and how fast the tempo (pulse speed) will be. Although, to be accurate, he generally gives it in the correct direction (related to a standard beat pattern) for the beat before the first beat of the music, which is not in the real world always "one." > the bottom, and "2" would be at the top. It's really reversed. You're giving too much literal meaning to a picture that's meant to show the concept of subdividing the beats, a process that's essential to playing each note at the correct time that doesn't fall directly on a beat. It's meant to show that each beat in the meter can be divided into smaller parts and that, if you beat your foot to the metric pulse, you also can represent the half-beat subdivision as the ascending part of the foot motion. Keep in mind that the book you scanned the page from is mostly aimed at young beginning students who don't try to think too deeply about what they're doing. For them this is a fairly concrete idea, not a theoretical exercise in Newtonian laws of motion. It's meant to illustrate that a meter consists not just of "one - two - three - etc. ", but also of parts of beats "one-and-two-and-three-and etc." and later even more fine subdivisions "one-e-and-a-two-e-and-a..." (which can't be shown with up and down toe movements, so the 16th notes will be drawn as syllables between the up and down arrows). What goes up must come down, and what comes down must at some time have gone up. Music is an aural, not a visual, art. Any visual images you run into in the learning process are meant to support, not define, the musical process they illustrate. Alright, that was a good answer. The important point for me is that numbers are when foot hits floors, and that's when metronome clicks will also be. But down the line, I'm going to be confused by ideas like the downbeat should be stressed. Because assume you have series of 8th notes. I think 1st 8th would be unaccented 2nd 8th accented, 3rd 8th (on "2") would be unaccented. That's because you're still wedded to that diagram. What you should do is forget you ever saw it and concentrate on the music, which (for traditional Western/European musical styles) is organized, like metered verse, into units of stressed beats and unstressed beats. You're overthinking, encouraged by a graphic that few other beginning students (of whatever age) question. But the problem isn't with the concept of accented and unaccented beats, which you can hear with no graphic help, but with the visual image itself, which in your case is confusing more than helping. Good teachers, when they find that a technique or explanation isn't working to help a student, find another way to teach the concept. Every student is different. Self-taught students, lacking the input from someone with more experience, need somehow to know when this is happening and find their own alternative approach. Forget about up and down arrows. They may or may not work for a specific 10-year-old (at whom they're aimed), but they aren't working to build your understanding. Listen to music, try to hear the metric organization and the way the faster notes relate to the slower ones. And Baseball is the backswing?